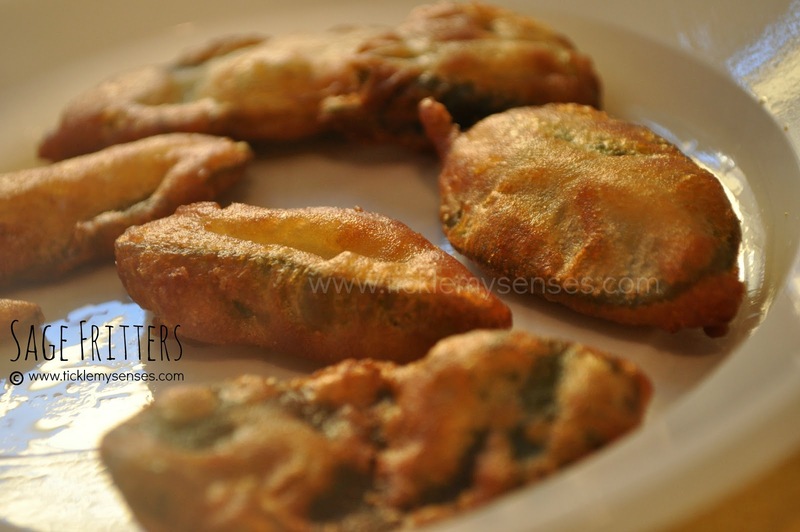 Tickle My Senses: Italian Salvia Fritta or Sage fritters. If you love the Japanese 'tempura' or the Indian 'onion bhajji' you will love these delicate Italian fritters made from fresh fragnant Sage leaves. We first tried these fritters in Florence, Italy in a small little fish joint and thoroughly enjoyed them. The crispy and light beer batter delicately covers the fragnant sage leaves, every bite is magical as it dissappears into nothingness within seconds. A delicious accompaniment for drinks the Italian way!! 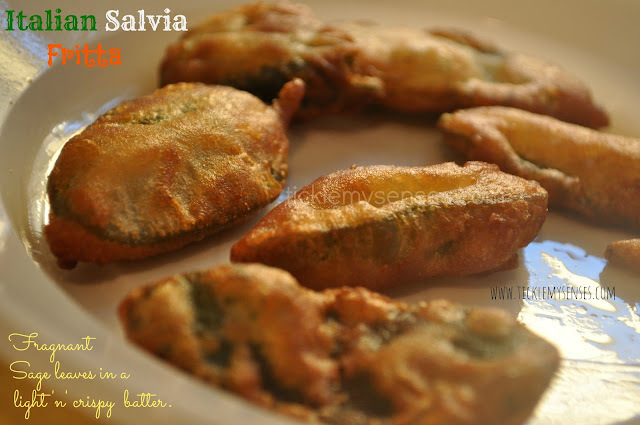 To Make Italian Salvia Fritta or Sage fritters. Serves: 4| Preparation time: 15 minutes | Resting time: 30 minutes | Cooking time: 15 minutes. 1. Place the flour into a bowl add the chilled beer slowly little at a time, whisking briskly to create a medium-thick batter. 2. Add the salt, oil and mix to get a homogeneous mixture. 3. Cover the bowl with a cloth and let the batter stand for at least 30 minutes. 4. Wash and dry the sage leaves well. 5. Fill a pan with oil to a depth of about 3/4 of an inch, and place over a medium-high heat. While the oil is heating, in a clean dry bowl whisk an egg white together with a pinch of salt till stiff peaks form, then gently fold the egg white into the batter. 6. When the oil is hot ( check by dropping a bit of batter into the oil, the batter should sizzle immediately and brown quickly or alternatively use a thermometer and check the temp should be around 360F. Dip the sage leaves one by one in the batter and then fry them quickly in hot oil in small batches turning them on both sides. When the sage leaves turn golden brown ( should take between 1-2 mins), remove them from the oil with a slotted spoon and place them to drain on absorbent kitchen paper. The batter can be prepared with chilled carbonated water instead of beer, but the latter (containing yeast) will help to create a lighter crispy batter during frying. That looks pretty good so it's a must-try. Just one question, did you use plain or all-purpose flour for this?